WordPress. Updates. Social Media. E-Commerce. Content. Many companies need more than the basic medical website or social media campaign to support their thriving business. MedForward offers several online tools to help your business succeed, including WordPress, online stores, secure online forms, and a powerful CMS platform. Whether you need e-commerce solutions to sell your line of skincare products or HIPAA compliant online medical forms, MedForward can customize each option to fit your practice. MedForward helps you keep your content up-to-date. Whether you prefer WordPress or our custom content management system, you can make your changes quickly and easily. Or, if you prefer, save time by letting MedForward make updates to your website. Either way, with fast turn around times, your content is always current. In addition, MedForward offers social media management services to keep your media presence active and content writing services to provide you with professional, well-written, original content for your various communication needs. We handle security monitoring for you. Your website will be monitored 24/7. We offer a mirror site to use as a "staging website" so that we can preview bigger changes before they go live. It is best to avoid free or low-cost templates because they are difficult to customize or update without interfering with their functionality. We build everything from scratch using PHP, so WordPress updates will not interfere with that functionality. With us you will get a high-quality server. We choose fast-loading systems for SEO and high performance. We can demo a WordPress interface that takes advantage of blogging, custom post types, so you have a tab for managing pages, treatments, before-and-after photos, and videos, separately and easily. 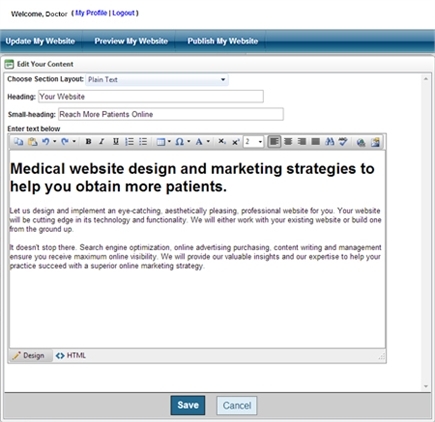 Also, MedForward can manage both content and infrastructure. One of the great features of WordPress is that you as the client will own your website, so you will have flexibility down the road. Working with MedForward gives you all of the advantages of WordPress with none of the aggravation of handling its inherent challenges. A carefully custom-built Wordpress site or MedForward's custom CMS makes updating your site easy and gives you automatic upgrades to the latest web platform. Use our easy-to-use editor to make updates. MedForward's social media marketing and management services can track your online efforts and keep your company engaged on social platforms. We can write original patient-oriented content for your website, utilizing our knowledge of your industry. Well-written, original, and organized content helps with SEO and makes your website a rich resource for patients. MedForward's experienced design staff can help you write and publish or distribute blogs, press releases, e-mail blasts, and other media and marketing materials. MedForward offers social networking set-up on popular sites including Facebook and Google+ to increase your exposure on search engines. Our social media experts can help your company establish an optimized marketing plan for maximum exposure and offer consulting advice and assistance on the best options for promoting your business. Our content writing services offer professional, targeted content for your blog, newsletter, or social media page. The MedForward Pages embedded contact request system lets you respond directly to potential patients using a set of e-mail templates that you can customize. Each new lead is recorded in the system and you can easily view your conversation history.